A friend invited a group of us to Iloilo, the province her mother hails from. We were going to be there to do absolutely nothing, which was fine by me. Our first course of action after touching down was to find something to eat, preferably fresh seafood, which the province is famous for. Our host directed us to Samurai Talabahan Seafood Talipapa, a large restaurant with a lot of customers, always a good sign. The restaurant’s interiors are a cross between native-inspired and carinderia-chic, the perfect ambiance for the type of food that they serve–no frills meat and seafood, the latter fat and freshly caught. We were ten people in the group. We were hungry. We ordered a lot. 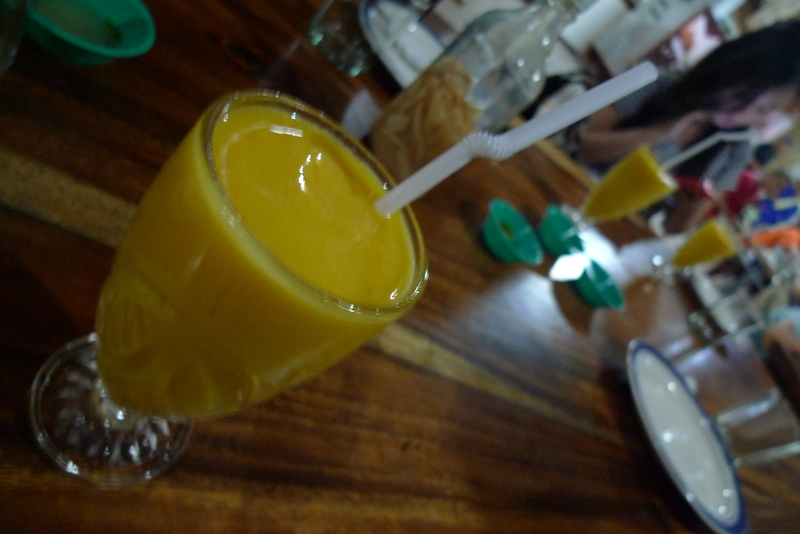 First, most of us had mango shakes. Some of us would order another one during the course of the dinner. Iloilo and nearby Guimaras are known for their mangoes, which ar big and sweet and juicy and are said never to be found in the Philippines outside of their parent provinces because whatever leaves Iloilo and Guimaras are exported to other countries. The shakes cost Php30 a glass, and though the glass was small, the shakes were sweet and thick and creamy, leading some of us (me included) to order more than one over the course of dinner. 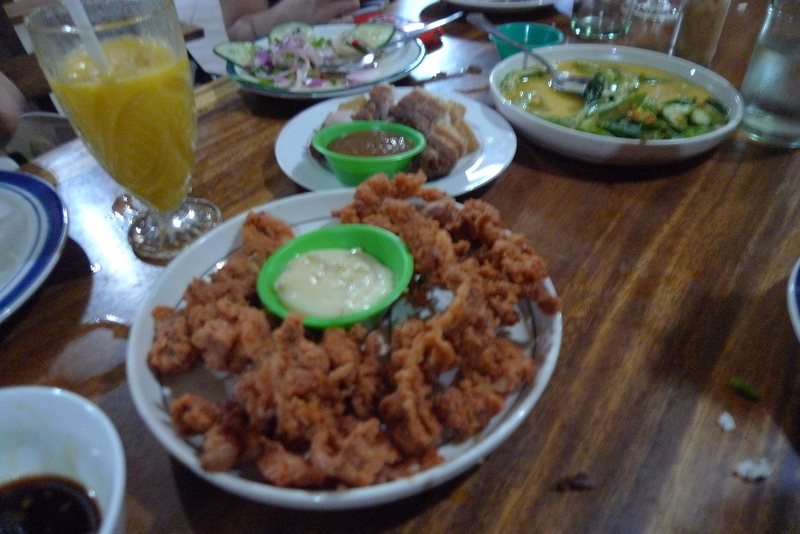 Other things that we ordered include the calamares (Php100), large squid rings fried in thick batter. Sorry about the blurry picture. 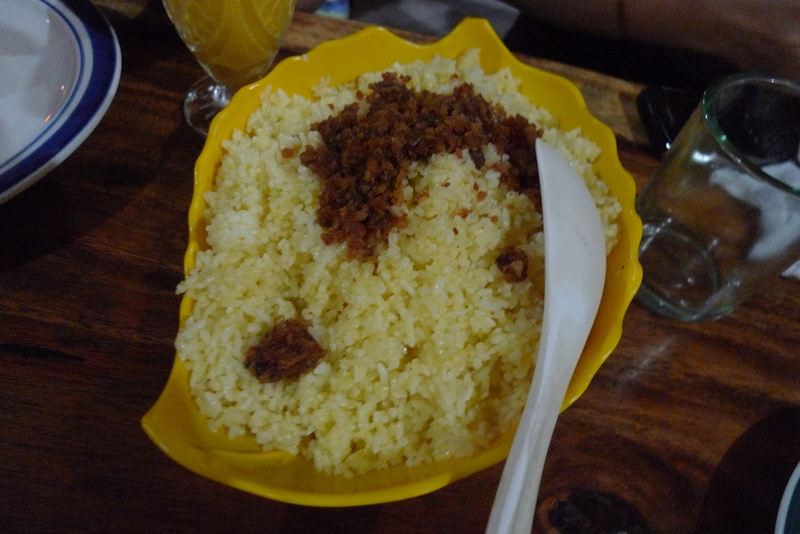 My hands were trembling from hunger and from the excitement of seeing our first plate of food since leaving Manila. Samurai Calamares and in the background, okra. 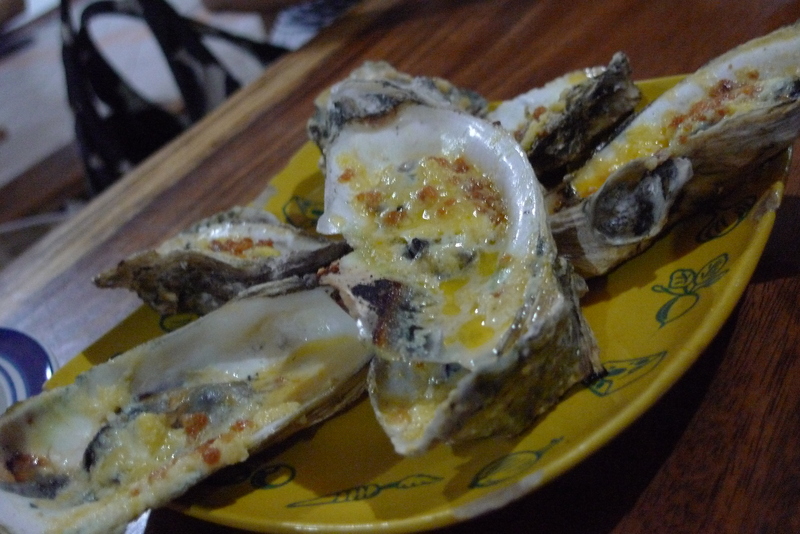 We also had baked talaba (oysters — Php75) and baked scallops (Php85), both plates filled with fat, juicy specimens covered with cheese and garlic and dripping margarine. The only thing I remembered from my last trip to Iloilo was the scallops, which I remembered were the best I had ever tasted. I was glad to find that my memory wasn’t romanticizing the memory. Ilolilo really does have some of the best scallops you will ever taste in this country. 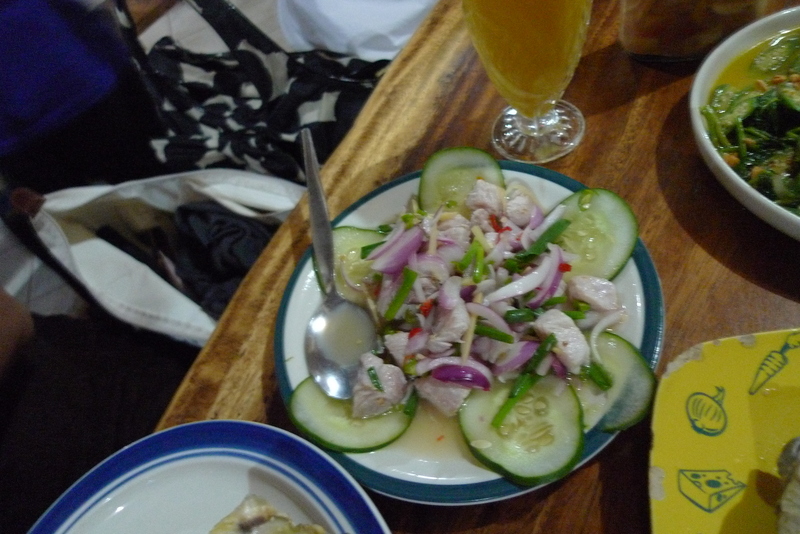 We also had to try the kinilaw, raw fish marinated in vinegar with ginger, onions and chili peppers. The kinilaw as quite good, the fish just about to cook in the vinegar, raw and soft and coated with a tangy sheen of sauce. 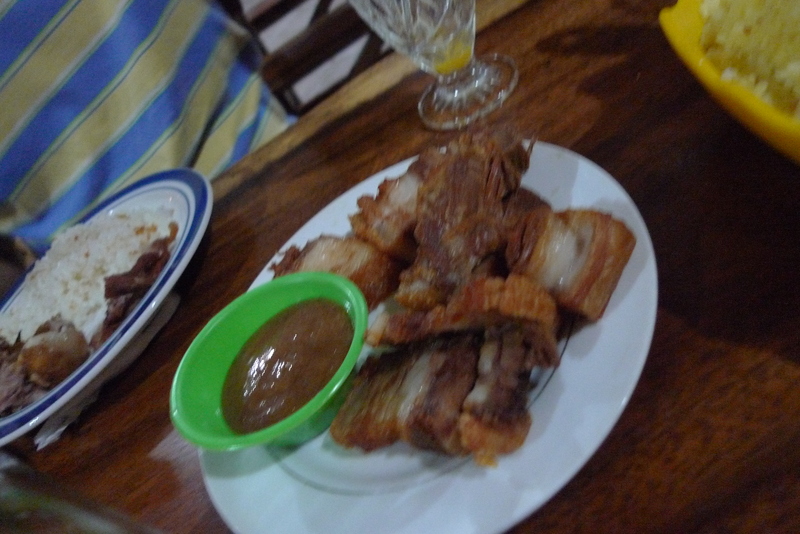 To balance the seafood, we had crispy pata and lechon kawali. 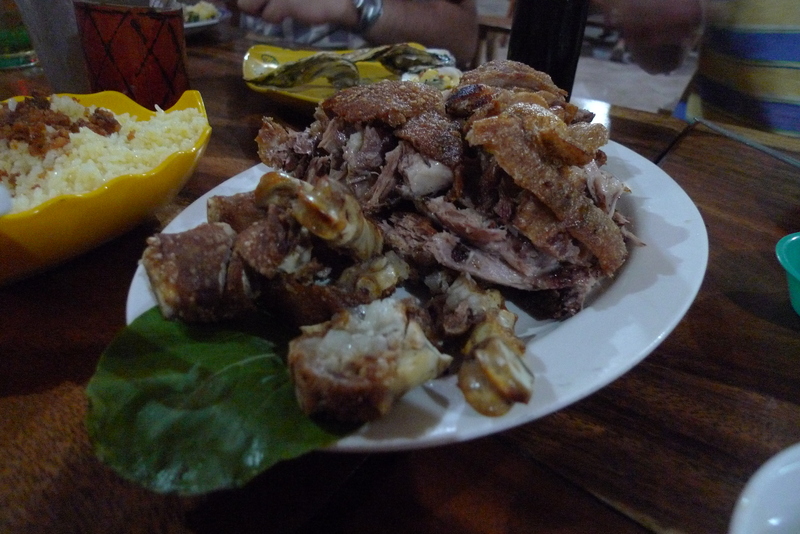 The crispy pata (Php295/365 for M/L) was crispy on the outside, the skin cracked like a golden shell. Its insides were soft and juicy, easily torn apart by fingers. I had a lot of it with the accompanying sauce and a lot of garlic rice. The lechon kawali‘s (Php100) meat was tough, as lechon kawali is wont to be, with a large amount of crispy skin, and a considerable layer of fat between both. We capped the meal with halo halo, which I think costs around the same as the mango shake. 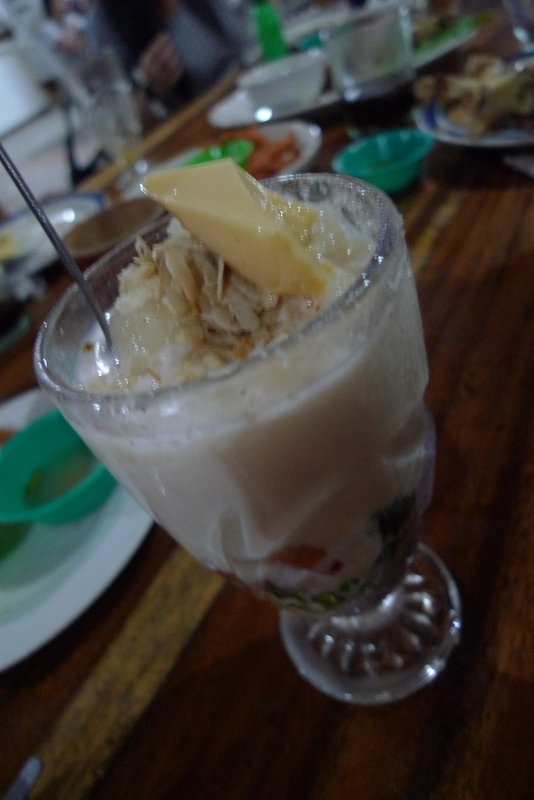 It’s good, as far as halo-halo goes, and was the perfect way to end an already satisfying meal. At the end of it all, we paid less than a thousand pesos, a very good deal considering we ordered two, sometimes three of each dish. Delicious food, excellent prices. I think this was hands down our favorite restaurant during that visit to Iloilo City.